One day, about 30 years ago, I was driving to work through busy Brisbane traffic and I happened to look up. I saw two things that have stuck in my mind until this very day. One was the most beautiful cathedral sitting very high up that I had missed due to concentrating on the traffic. The other was a graffiti sentence that I could never miss again, after that day. It simply read ‘ Further we travel into the nightmare’. I felt someone understood my plight of being a then divorced single mother and completing training in my chosen field in the hope of easing my financial situation. Ok, I hear you thinking ‘how does this relate to the making of an e-book’? I guess it was the learning curve I was on to complete this task of converting my out of print book into an e-book. I was at the same time updating my original InDesign files to tidy them up for Print on Demand. I might add that I am an artist and writer, not a graphic designer, so this type of work is always challenging. I am older and wiser since those early days in Brisbane and when I heard myself say, as I worked on the files on the computer, ‘This is a nightmare’ I pulled myself up quick smart. I must have been running my hands through my hair as I worked because on glancing in the bathroom mirror I was quite amused by my Andy Warhol hair-do. I had only just read a short chapter on the Renaissance physician known as Paracelsus who walked outside the establishment in his beliefs regarding healing of the body and mind. He believed that we must have FAITH to be STRONG and PURE and not weakened by DOUBT. If a very small child did not believe it could walk, and did not want the same walking success as its family, then it probably would not keep trying. So yes I finished the task, and my e-book is launched. I found a great inexpensive software program called Jutoh, by a very helpful Dr Julian Smart, with an English rather than an American dictionary, and it built an interesting range of e-book formats. I also found that there are many options for my e-book, from Kindle to those offered by Ingram Spark, who could also produce my Print on Demand book. I was disappointed initially that Amazon’s Create Space wasn’t an option, as it will only pay royalties to Australian authors by international cheques. That is out of the question due to the high bank fees. Meanwhile if you would like to view my efforts take a trip to amazon.com. 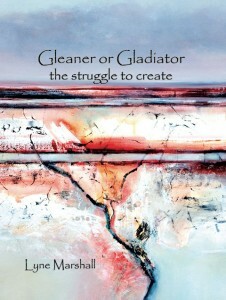 If you have my original version of this book Gleaner or Gladiator: The Struggle to Create or buy the new e-book, I would be ecstatic if you could please write a kindly review. The days currently are balmy. There is electricity in the air and a sense of expectation. Perhaps it’s due to the heat and the sudden light showers of rain mixed with late afternoon storms. For me it is the best time of year in Australia. Christmas is past for another year and now I am painting in my studio, mostly discarding the results, but at some stage the tide will turn. Have you written your list of things to achieve this year? The new year can bring new beginnings. My list as always is a little daunting…so much to do yet so little time. It begins with the steps needed to produce my first book, Gleaner or Gladiator, nearly out of print, as an e-book and goes on to include designing new brochures and pulling together my new workshop. Lastly I want to brain storm ideas for an art project, which includes visiting the lands of my ancestors, for later in the year. I won’t include producing artworks in my to do list as it is a given event for most days. It takes a few rehearsals to get the good work out after travel but I need it flowing to have some new works to include in two scheduled exhibitions, before I get distracted with the marketing side of things. This part of being creative can’t be neglected but how do we manage it all without employing an assistant? My budget doesn’t run to that option unfortunately. A solid foundation built over time is the best possibility for adding new rooms to your house of cards. Fortunately for me I am researching these building blocks and making notes for my new workshop ‘Preparing for Creative Success’ to be held in my studio at Tallegalla in S. E Queensland in April. The most exciting part of having an open mind is to never know what ultimately lies ahead. Staying positive includes being ready for success so you are able to take up what life throws at you. I wish you a prosperous and happy New Year my creative friend.